We individually handcraft our Cedar Guideboats in lengths from 13 to 19 feet. It takes us about 400 hours to build one and we are told (and believe) they are the finest boats of their type in the world. 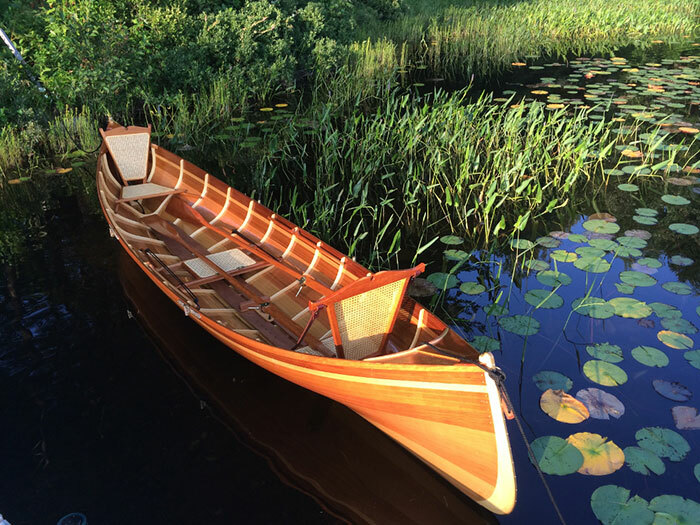 We blend contemporary materials and techniques with the traditional form of the Adirondack Guideboat. Our woods are carefully selected and joined—one to the next. The exterior of our wooden boat is covered with a protective layer of nearly invisible epoxy and fiberglass. Strong, elegant, beautiful. Given a modest degree of care, our boats are built to last many lifetimes. The boat hull is built with western red cedar, spruce ribs and stems, a pine bottom board, cherry gunnels and decks and ash rub-strips. The Cedar Guideboat includes two maple oars, three cherry caned seats, one cherry caned backrest for the stern seat, one cherry caned backrest with adjustable leather straps that moves between the bow and center seat, one cherry footrest, Okume floor boards, and two sets of oarlock straps. A picture is worth 1,000 words so watch this beautiful six minute video, by Martha Stewart, tells a good story about her boat and our company, and the evolution of one of the world’s finest rowing boats.